Thinking about a kimono for me, I realized I hadn’t shown you some post War II Japanese fabrics from my late Mother-in-Law’s stash. My Father-in-Law had sent these home to his new bride and mother of his twin year old sons and brand new baby boy (my husband). 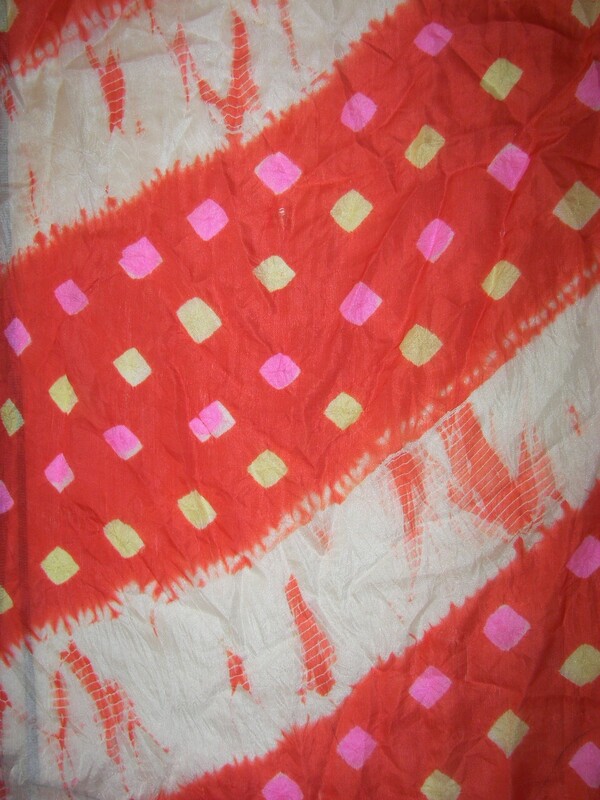 Shibori and tie-dyed silk chiffon, 23″ wide and 7 yards long. The colors run on the bias up the length of the yardage. 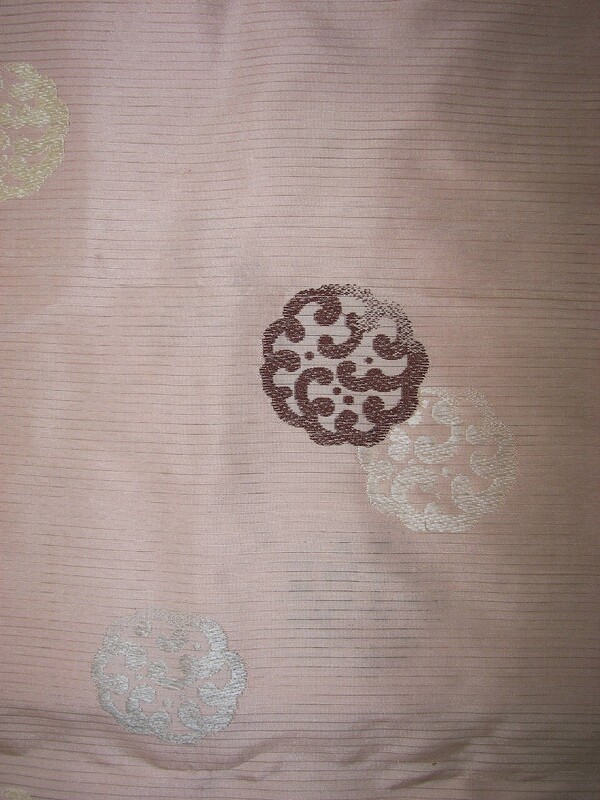 This would make a beautiful sash or lining for the interior of the kimono. You can’t see it so well in this photo but the fuchsia and yellow squares still show the raised bumps from having been tied to block the orange dye. 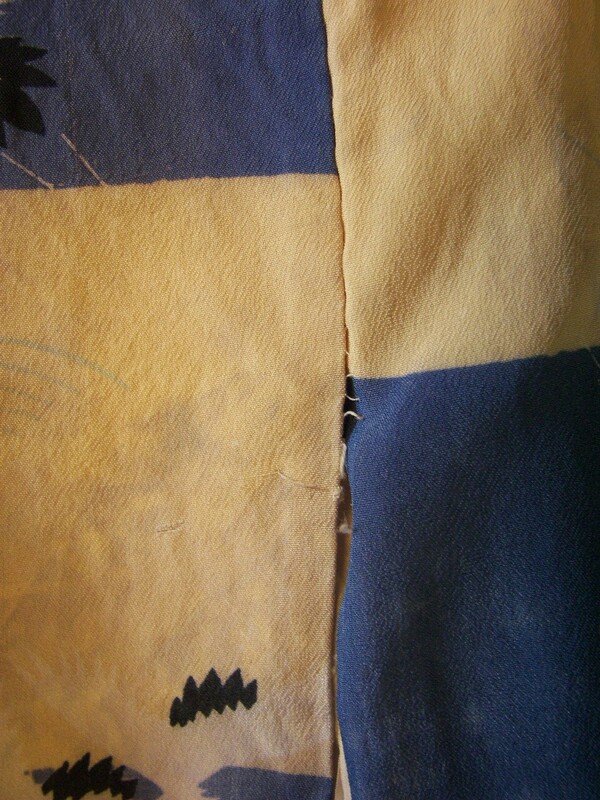 It is sold this way to prove that the color block were created by shibori methods rather than printed on to the silk. I am guessing that the fuchsia and yellow areas were first painted onto the fabric, then the square shapes were tied off as was the white areas and the scarf fabric was then dyed orange, all done on carefully spaced diagonal placements. Unfortunately it has 4 1″ long chunks cut out of it in random places and a few spots that look like machine grease or tar. I don’t even want to know the history of the damage, after all it has been 60 years and 7 kids since a Polish American sent it to Hamtramck, Michigan, from Tokyo, Japan. 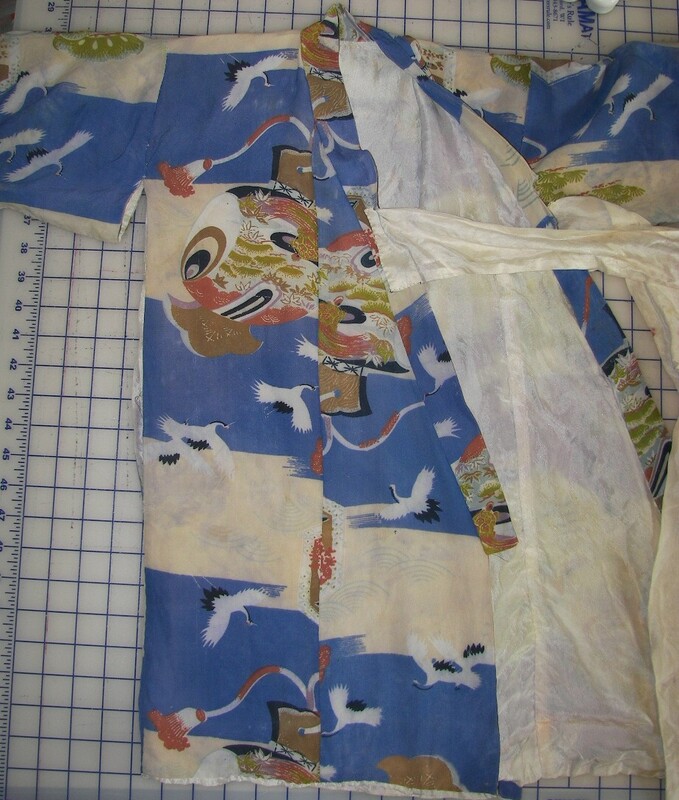 This is a tiny kimono, done in a woman’s style with lining to the edge and open armscye. The off white ties were obviously added after it reached it’s American home. It’s in very poor shape. Chucky said that all the children had worn it, that might mean that all 7 rough housed and daydreamed in this tiny garment. It has originally hand stitched throughout with this carefully placed single strand hand construction. All the kimonos are stitched so beautifully by hand. I don’t know if it was sold new as a child’s kimono (it’s not exactly the traditional style for a child’s kimono according to the Kimono book) or is perhaps an old kimono salesman’s sample??? 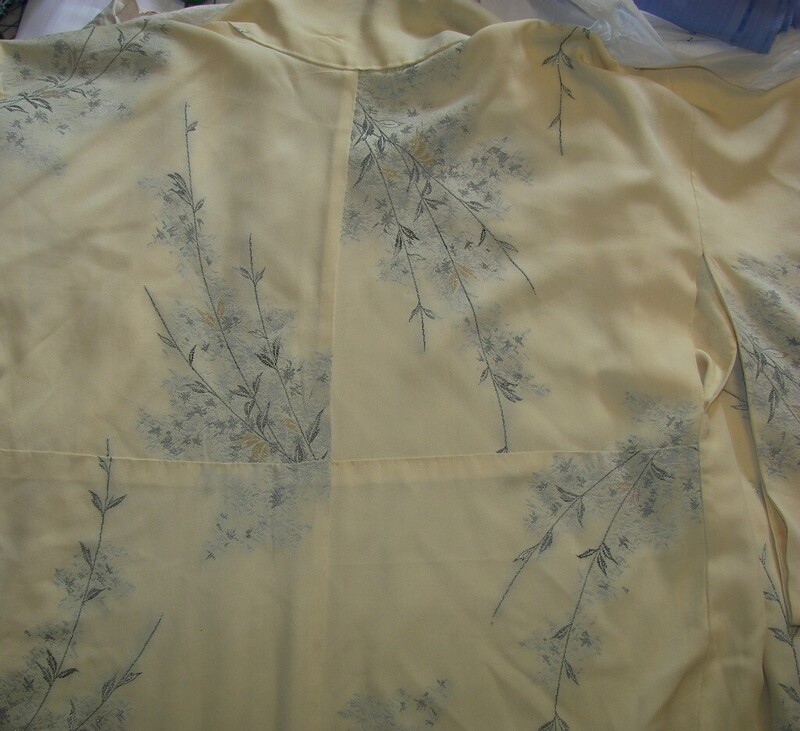 This is a kimono that I bought on ebay a few years ago. The purple silk fabric is backed by cotton batiste in 2 colors. 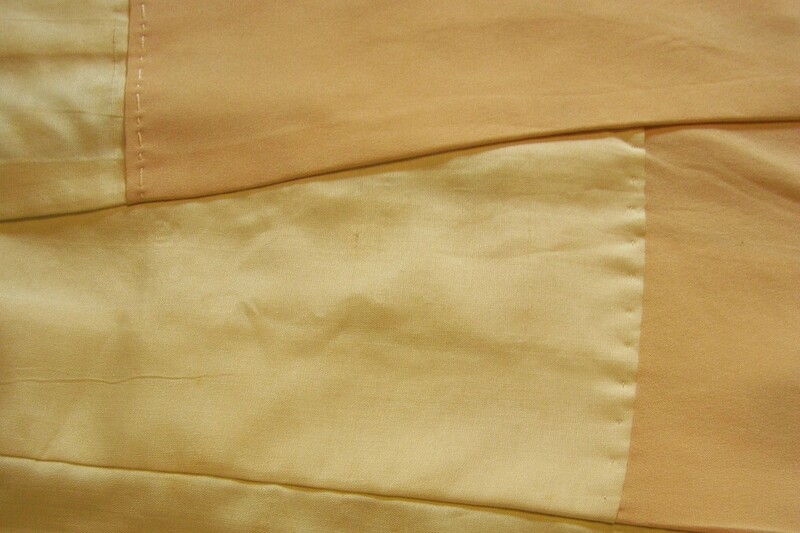 The lighter peach is visible at the sleeve opening and the darker orange is visible at the under arm openings. 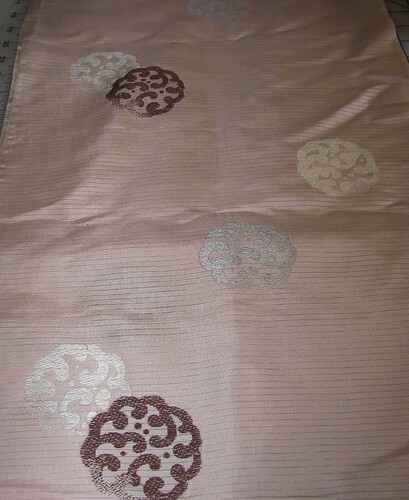 It was over a year ago that I purchased Husband’s kimono cloth at Silk Road Fabrics in Austin, Texas. 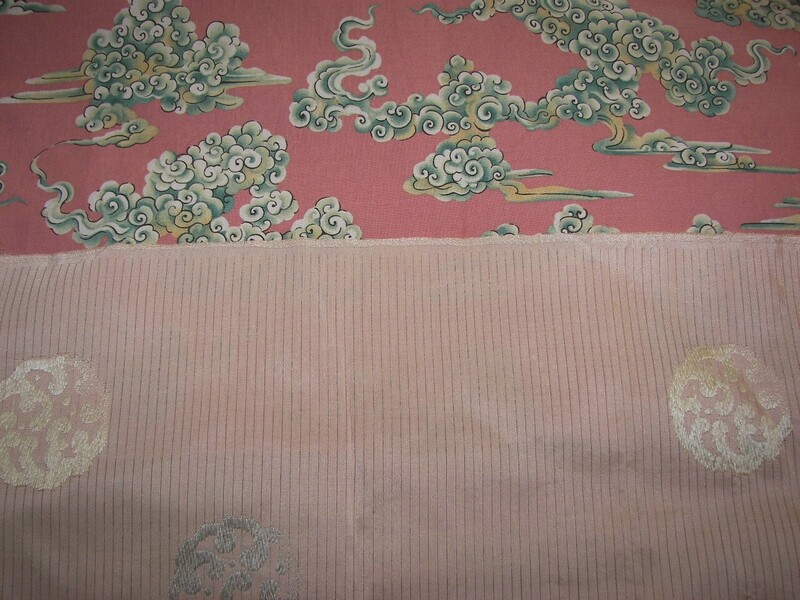 I bought this Alexander Henry “Buddha Clouds” piece because I thought it might work with the Obi fabric. When I shop away from the stash I have to go with my best guess and it doesn’t always work out. 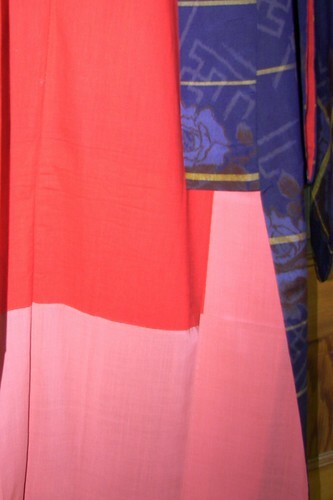 As you can see from the traditional kimonos above the colors do not contrast enough to show the obi up very well. So that leaves me still puzzling through my own kimono and the old Obi nestled back in the stash, safe from the ravages of use and wear for another how many years? Posted in Kimono, Sewing. Bookmark the permalink. I am fascinated by changing patterns and colored threads. I sew garments and am teaching myself to machine knit. Since selling the building that housed my workrooms, The Stitchery, I'm searching for a place to set up the knitting machines again. There must be room here somewhere! 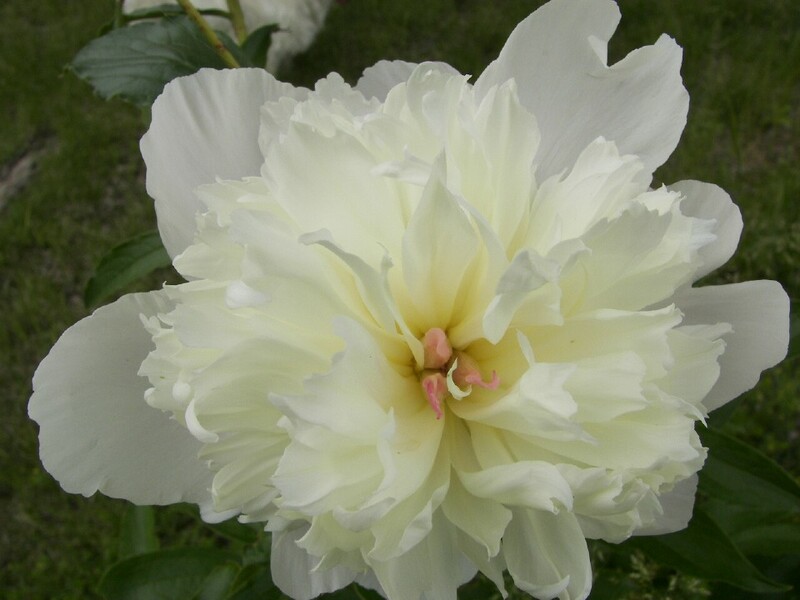 I added your blog to a new sewing blog directory http://welovetosew.blogspot.com/ that sort blogs by freshness. The blogs with new posts are always moved up to the top. Please check it out and recommend it to your sewing blogger friends! How lovely! I just adore that piece of shibori, yum. Thanks for sharing with us. Lovely musings. Thanks for the tour. 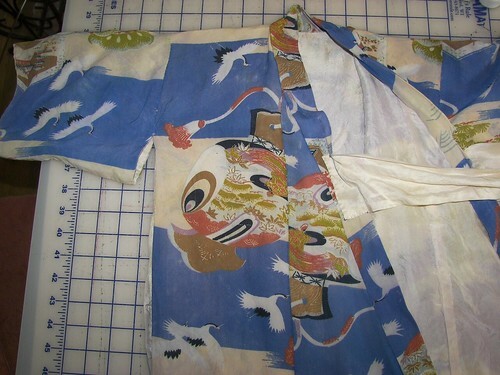 I have to wonder about the fabric I bought from the Mother Rice Thrift Store in Honolulu when I was 15. It is 11 yards long and 12″ wide, mostly purples and oranges, a floral with a geometric background. Never had the guts to cut into it. I should check out your kimono book, maybe that will give me courage. What luscious fabrics and garment details! Thanks for sharing them ! Thank you for sharing your lovely kimono pictures! Regarding the yellow one with metallic threads: In studying my own (mostly ebay-purchased) kimono, I’ve discovered that the sewing across the back is usually a fold and not a seam. 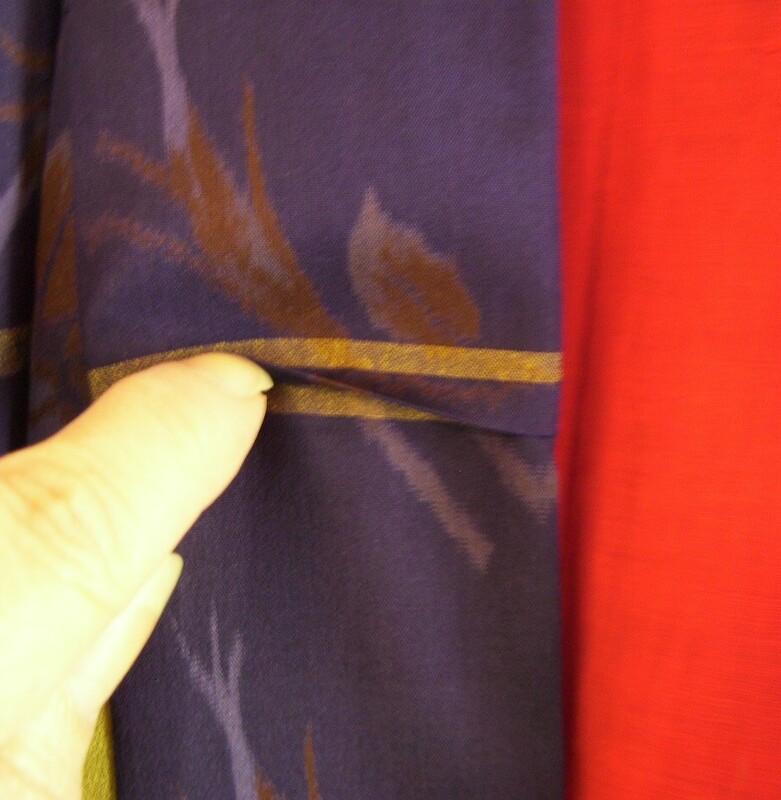 Reading the old Immortal Geisha threads explained this–since the kimono are always cut the same with the neckline about half-way, a younger woman (who would wear her collar a little lower) would have her kimono sewn with this tuck. It pulls the neckline back while keeping the sides seams even(and the sleeves are sewn on after the tuck is put in). 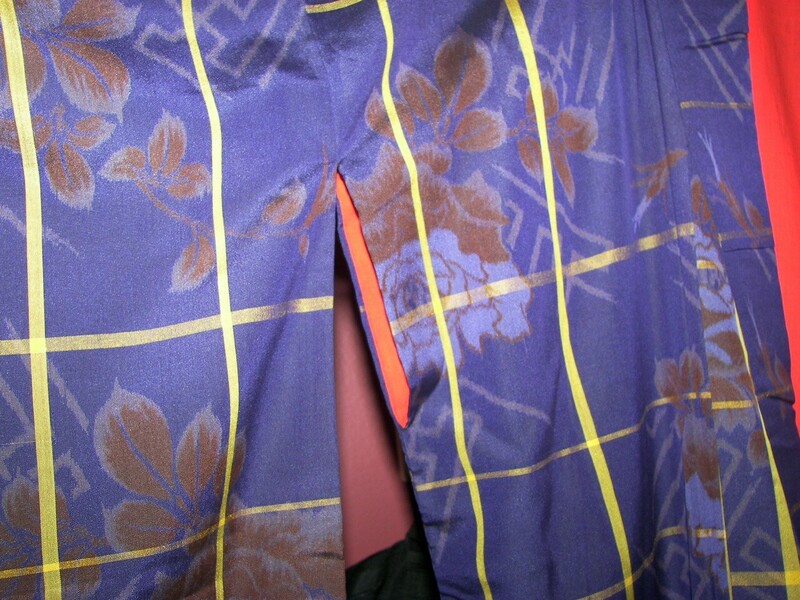 Sometimes it is a seam, tho, if the fabric’s print has an obvious “upside down” when it goes over the back (like some yukatas). Also, when the kimono is cut, an extra collar piece is included and sewn over the collar, to protect it from wear.